I have something of a passion for literature, as regular readers may have noticed. I also have a fondness for literature within SL – hence why I try to support Seanchai Library through my posts on their weekly schedules. So when I’m told about a new library venture that’s opened in SL, I’m going to hop over as soon as time allows to have a look. The Chamber Library is the work of Storm Septimus, and while it opened on September 21st, she is still working to expand the facilities. Described as a “one-of-a-kind, bringing together art and literature in a never-before-seen way”, the Chamber Library presents visitors with the opportunity to relax with works of literature and poetry from a wide range of authors, including TS Eliot, Shakespeare, Oscar Wilde, Arthur Conan Doyle, Voltaire, HG Wells and The Brothers Grimm – with more titles and authors being added. 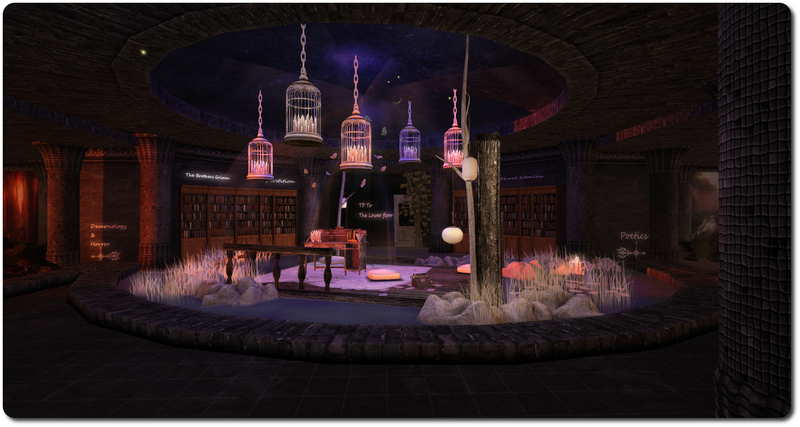 In addition, writers and poets from within Second Life can offer their own work for inclusion in the Library’s section devoted to resident’s writing if they so wish. All works are available to read via note card, and the bookcases containing them are all clearly labelled. As its name suggests, the Library comprises a series of chambers spanning multiple levels (the third should hopefully open on September 29th), each chamber provides something of an artistic theme, where people can enjoy the writings they select in a suitable ambience. 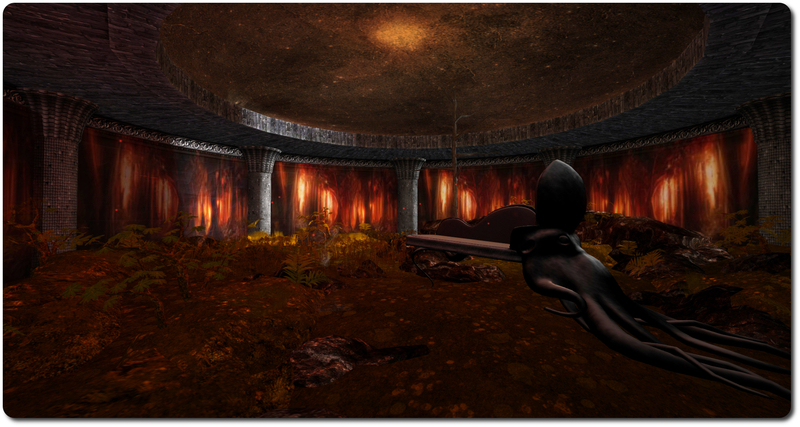 Located just off the main library chamber, for example, is a ruddy landscape where the trees stand denuded, their trunks split and burning within, and a baleful light pervades the surroundings – ideal for settling down with a horror story or a tale of demonology. Across from this is the poetry chamber, where waves break upon the shore, great horses rising from them as they crash over rocks, and a stormy seascape forms the backdrop. Places to sit can be found throughout the Library – although going on its popularity, there may be a need to add a few more sooner rather than later! 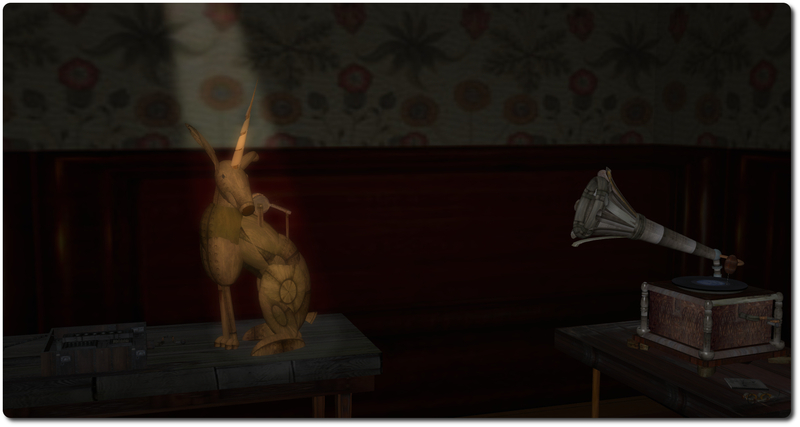 – while down in the mid-level area, reached via a teleport point in the main chamber, not only can further reading material be found, but an old Mah-jong table from way back in SL’s past offers itself to those who wish to while away their time a different way. Next door is an area which may have the blood rushing to your head! The third level, from the cheeky peek I took, appears to have something special for lovers of Poe. Art plays an important element within the Library, as evidenced by the horses mentioned above, and it is clear that Storm has put considerable effort in creating a unique environment in which art and literature can be enjoyed. Looking at the guest book, it’s clear that many people have already enjoyed their time at the Chamber Library; hopefully this will continue well into the future. If you do have writing you’d like to share with others, be it fiction or poetry, you can drop it into the bookcase at the landing point. If you’d like to get more involved in the Library, Storm is always looking for help in creating note cards for inclusion in the various bookcases, simply contact Storm directly to volunteer. There is also a 7th Circle Group you can join to keep abreast of Library developments. 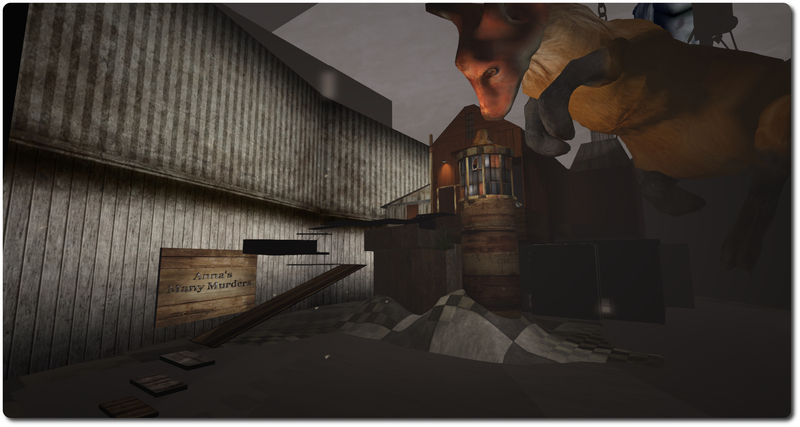 All told, an interesting addition to Second Life, and one I’ll be keeping my eye on! Such is the extent of Bryn’s work, that and in-depth retrospective is perhaps long overdue. Chance Acoustic and Art Blue have offered a modest, but attractive means of celebrating Bryn’s work through A Room for Ferrisquito. However, Bryn’s catalogue is so vast, it cries out for something more extensive. Until recently, Bryn has fought shy of offering such a retrospective herself. However, she was recently invited to participate in the Art & Algorithms digital festival in Titusville, Florida, where she is one of a number of digital artists exhibiting their work through the festival’s digital lounge, and thus Bryn Oh retrospective 2007-2014, has been born. This is a comprehensive study of her work, which might be said to span two locations in SL. The primary focus for the retrospective is a region-wide installation at LEA9, where visitors can explore the development of her art over the years chronologically. The second element – primarily aimed towards to the Art and Algorithms event, is an invitation for them to experience The Singularity of Kumiko on her home region of Immersiva – where she states she has instructed Mr. Zippers not to slaughter anyone should they do so! The LEA9 installation is an immersive, multi-faceted endeavour involving elements of her work in both 3D and 2D together with information boards and links to machinina pieces on YouTube. Interestingly, most of the pieces on display are not Bryn’s own choices; as far as possible they’ve been drawn from suggestions and requests provided by members of her Immersiva in-world group. Putting some of this together wasn’t easy, as Bryn informed me on inviting me to take a look around LEA9. 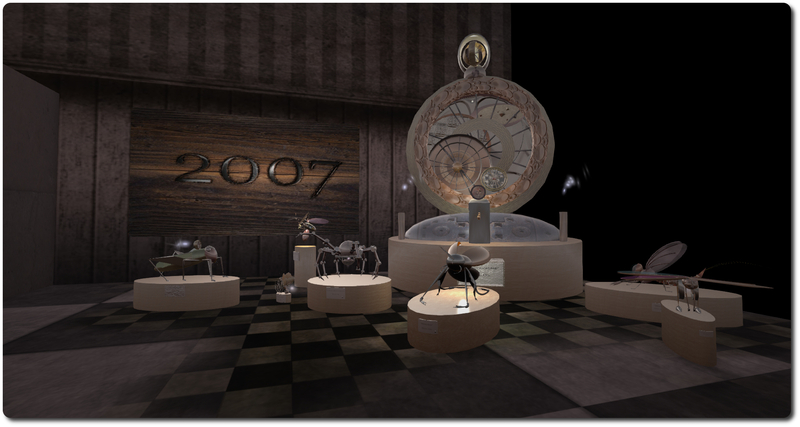 “I discovered that all my really old work from 2007 etc., are now all unlinked and the prims migrated in some cases!” she said. However, if any of the early pieces on display had to be put back together, I’d say the time spent doing so has been more than worth it, because LEA 9 presents the visitor with a fascinating voyage through Bryn’s work – and more. Those familiar with Bryn’s art over the years will doubtless recognise many of the items on display and regard them with fond memories; they may even trigger reminiscences about art, SL and more. Each year is presented in it own space or spaces, combining individual pieces with sets from some of Bryn’s more immersive, region-wide designs. 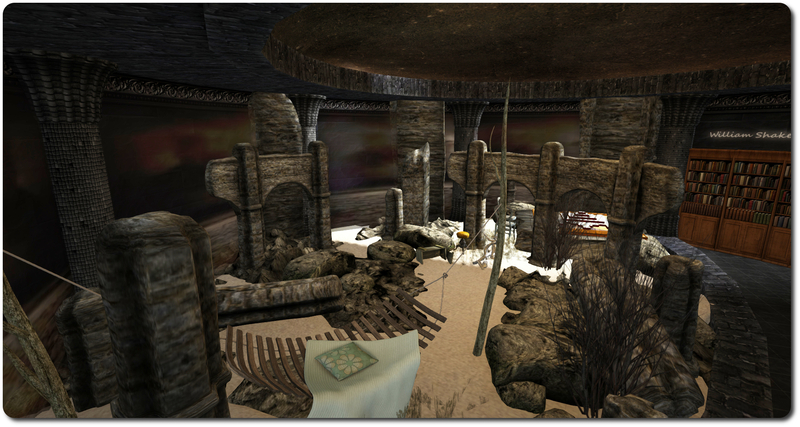 Large signs denote the years as you come to them – make sure yo take the welcoming note card on your arrival, and do take your time exploring; there is a lot to see and read – and not all of it in the exhibition spaces, as noted there are a number of opportunities to watch machinima of Bryn’s work, such as the one below for Condos in Heaven. Bryn is known for giving insight into her creations through the pages of her blog, where she frequently allows us glimpse her creative thinking. In many ways, this retrospective is a deeper extension of that process. Exploring it, I felt I was not so much looking back over her work of the last seven years but had in fact entered her “Country of the Mind”. I make no apologies for using a fictional construct, as given form by Greg Bear, to describe my response to viewing this installation; if anything I’d say it was actually appropriate. “Bryn Oh” came into being as a way of exploring whether a digital character unaligned with any physical identity could gain acceptance as an artist in her own right; given the world-wide renown Bryn’s work has attained, there is little doubt she has achieved this goal. But creativity is rarely purely an outward expression; through the creative process, we often define or enhance or influence or own thinking and perhaps reflect facets of our personalities back to ourselves as much as display them outwardly. 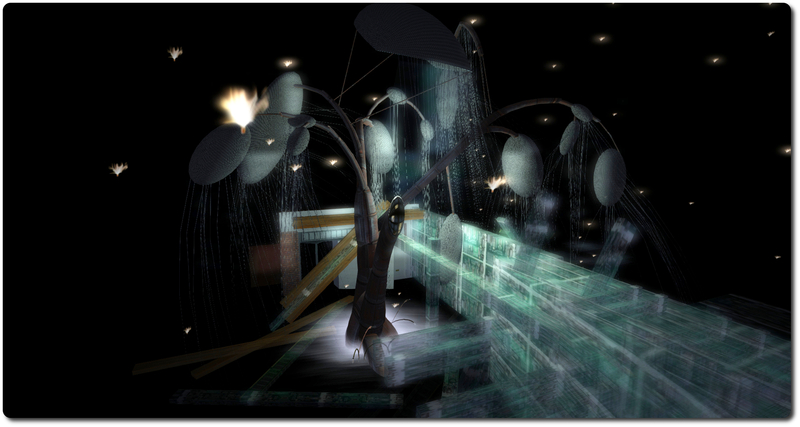 As such, wandering through these spaces within LEA9 gave me the sensation that I was witnessing not only the growth of Bryn’s artistry within SL, but was also seeing the growth of her persona as a distinct entity separate from the human mind behind her. It’s as if each of the pieces on display, from the small to the large, form aspects of her “big and little selves”, to use Bear’s terminology, each reflecting a facet of her creativity and drive, which blend together and with her Primary Self – the human mind behind her – adding to her growth as a distinct personality. I actually mentioned this idea to Bryn as I toured LEA9; I’m not entirely sure what she thought of my perspective – but she seemed intrigued. My point here is that this installation is more than just a simple retrospective display of past works; there is something very tactile about it which speaks as a voyage through the developing of Bryn as a personality as much as to the creative beauty of her work. As such, it is a fascinating place to visit and in which to dwell. Certainly, this is an installation – a country – worthy of careful exploration. There is a visual and written richness to it that is engaging and well deserving of the time one can spend immersed within it. I can honestly say I have spent more than two hours within the installation following Bryn’s invitation, and I will doubtless be returning to it again. The following notes are drawn from the TPV Developer meeting held on Friday September 26th, and shown in the video above. Time stamps, where relevant, have been included for ease of reference to the video. Note that items are listed according to subject matter, rather than chronologically, so time stamps may appear out-of-sequence in places. My thanks as always to North for the recording. [01:00] As noted in part 2 of this report, a new GPU Benchmark project viewer is available (version 3.7.17.294710), designed to put an end to the need for a dedicated GPU graphic table as the mean by which the viewer determines a computer’s initial graphic settings. Instead, if there is no settings file for the viewer (such as after a clean install), the viewer will measure how quickly data can be copied back and forth between GPU memory and your computer’s main memory. This, combined with a couple of other benchmarks, determines the initial graphics settings in the viewer. It may not always pick the most preferred settings (it might still set things a little high or a little low), but testing has shown it to be reasonably accurate, and it does prevent the viewer opting for the lowest settings simply because a card isn’t listed on the GPU table. As is currently the case, any subsequent adjustments you make to the graphics settings should be saved within the viewer and take precedence. Feedback on the viewer is encouraged (a wipe of any SL viewer setting files on your computer will be required), particularly if you encounter issues such as finding the viewer “sticks” with the settings it has determined, rather than allowing you to adjust them. When filing JIRA, the Lab requests that log files are attached. [09:39] The anticipated HTTP pipelining viewer should be appearing as a release candidate viewer in the early part of week 40 (week commencing Monday 29th September). This is the viewer that the QA team in LL have been referring to as QA, “weaponized viewer”, it is so fast as a result of leveraging the HTTP streaming. This viewer works with the CDN, with Oz Linden indicating a personal experience of logging-in to a CDN-enabled region with an empty cache and having the textures and meshes for the region loaded by the time the log-in process had finished, so it will be interesting to see how the viewer performs under more widespread use. TPVs are being encouraged to adopt the HTTP updates as soon as their integration / release cycles allow. In the meantime, those wishing to test this viewer, when it appears, with the CDN can do so via one of the following regions: Denby, Hippo Hollow, Hippotropolis,Testsylvania, Brasil Rio, Brocade, Fluffy, Freedom City, Rocket City or Whippersnapper. It is anticipated further regions will be added to the CDN channel (Snack) in the next week or so, prior to CDN support rolling to one of the server RC channels. [17:16] Another batch of viewer updates due out, and which TPVs are being urged to adopt as soon as they can, are for voice. These mostly relate to managing voice sessions rather than voice improvements, and are aimed at helping Vivox with problems at their end, and should make troubleshooting genuine issues within voice a lot easier. However, this update should plug the hole where stalkers can track where someone using voice has teleported to just by monitoring their voice channels. [18:42] Vir Linden is now working on the z-offset height proposal. The work is in the early stages, so no date on when it will appear in a viewer. The current plan is for a new option to be added to the right-click avatar context menu which will access an adjustment slider. However, at present, any adjustments made using it will not be persistent across log-ins, although it will work alongside the existing Edit Appearance > Hover option (allowing for the No Mod shape limitation of the latter). It has been suggested the offset setting could be made persistent by tying it to a debug setting. This is something the Lab has said they’ll think about; should they opt not to go that route, there will hopefully be no reason why TPVs should not go that route if persistence was deemed vital to their users’ experience. [48:13] Adjustments made using the slider will occur locally until such time as the mouse button is released; only then is an update message sent to the server & relayed to other viewers, to prevent multiple messages spamming a server as people make adjustments. It is hoped that this approach will also allow z-offset adjustments to interact with other active animations relatively smoothly (e.g. adjusting your height to prevent appearances of dancing on air when using couples dance poseballs).